After a very peaceful night at the cuttings we rose early at 7am and we got underway dead on 8:30am. This is early for us but we wanted to cover some ground as we have a very important meeting in Moore on Friday. We are to meet with our eldest's, Amy, boyfreind's mother and partner for a meal! Amy has only been courting him for 7 years and this will be the first time we meet them. Nervous or what! The Trent and Mersey can be narrow in places but is quite nice along this stretch. We rounded a corner under a bridge to this delightful garden complete with bear standing guard. After rounding another corner a familiar boat came past. It was one of our mooring nieghbours at the marina. We quickly exchanged pleasantries before they disappeared round the next bend. We often hear on the news about the HS2 link and how it will affect the canals. Along the towpath these signs have been posted by C&RT. This certainly bought home the reality of it all for me. I guess a lot of closures will occur as the bridges are constructed and put in place. As we are near Northwich the salt mining town evidence of the mine collapses becomes evident with several "flashes" like this one along the way. We crossed three of these on the way to Anderton and now look like they have become lovely nature reserves. Not everything man does ends badly I suppose. though amenities look scarse at the present. One blot on the landscape here is the rather large salt works that spans the canal. So reminds me of my operator days back at the refinery. Though not interesting for many I find it fascinating to compare the equipment and ponder its purpose as its similar to the plants at the refinery. through some tight narrows one wonders if we have taken a wrong turn. After some lunch we decided to go in search of a shop. A quick check on google maps revealed a co-op a mile away in Barnton. Smudge was due his main walk so we took our selves off over the bridge and up into town for some shopping. View of the lift from the bridge. this is the exit pound with doors closed to protect the canal levels. Having stocked up we walked back and stopped in the Stanney Inn for a well earned pint of Strongbow Dark Fruits to refresh ourselves before returning to AmyJo. The food looked nice here so we may have to sample it next time we're this way. They moored up and knocked to sheepishly ask if it was OK that their stern button was resting on our bow button. Seems the old boy refused to move up a ring despite there being room to do so. The poor Norwegians looked so upset it was clear the old boy had unnerved them. We did our best to reassure them all was fine but I felt it still worried them. I had a bit of room behind AmyJo so using longer lines to share the next ring back managed to pull her back 4 feet and off their button. I did not want them worrying in bed tonight that their boat was hitting ours so now hopefully now they can rest easier. I always move up when asked as I would ask someone to do the same if needed. 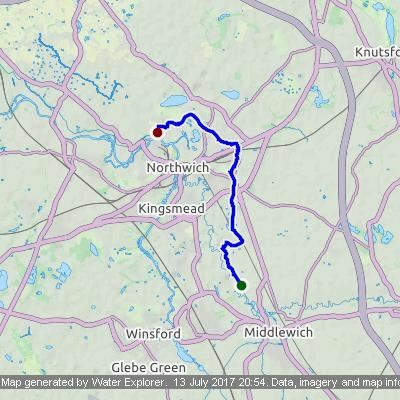 Tomorrow is new territory for AmyJo as we pass onto the Bridgewater canal. The Bridgewater is not part of the C&RT owned canal network but is owned by Peel Ports LTD. We have 7 days to pass through or we'll have to purchase a short term license. This will then take us onto the Leeds & Liverpool canal and the furthest North AmyJo has been so far.